At least 24 fatalities, including nine children, were reported after a record-breaking tornado swept through the Oklahoma City suburb of Moore, destroying hundreds of buildings and two schools. Original reports put the number at 51 deaths. 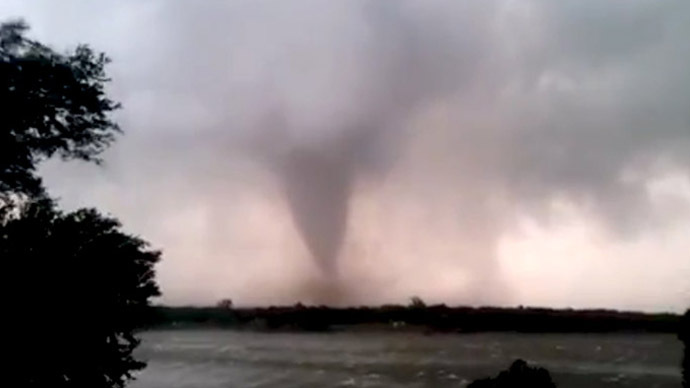 A large tornado touched down on Monday in Moore, Oklahoma, a suburb of Oklahoma City, causing catastrophic damage to several housing developments and at least two schools in the area. A local television news helicopter tracked the tornado as it moved through the area, and then began to survey the extensive destruction to the region. The tornado has since been rated as an EF5, with winds in upwards of 200mph. "We have got good news. The number right now is 24," said Amy Elliott, chief administrative officer at the Oklahoma City Medical Examiner's Office. The prior figure of 51 dead may have included some double-reported casualties, Elliott said. "There was a lot of chaos," she added. Elliot said all but three bodies that have been recovered have been identified and are being returned to their families. She cautioned that additional bodies could yet be recovered from the rubble. Mayor of Moore, Glenn Lewis told CNN on Tuesday that the rescue effort is continuing and "we're very optimistic we might find one or two people." 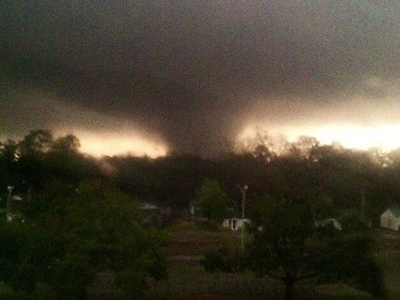 Over 233 were injured by the tornado, including around 70 children. Many of the victims being treated at two local hospitals. Authorities say that 101 people have been rescued from the rubble thus far. "We don’t yet know the full extent of the damage from this week’s storm – we don’t know the human or economic losses that may have occurred," Obama said in a statement. "Our prayers are with the people of Oklahoma today and we will back up those prayers with deeds for however long it takes." Oklahoma Governor Mary Fallin said on Tuesday that her state will rebuild and asked for prayers throughout the rescue and recovery process. "Will we be back? Absolutely. Oklahoma has gone through this a couple times and we’re resilient, strong, courageous people," Fallin said on ABC's Good Morning America. Monday's storm appeared to be the deadliest tornado since 2011, and one of the worst in the last 20 years according to the Atlantic. The town lies in the center of 'Tornado Alley,' an area west of the Mississippi River stretching from north Texas to South Dakota, known for its frequent and powerful tornado systems. 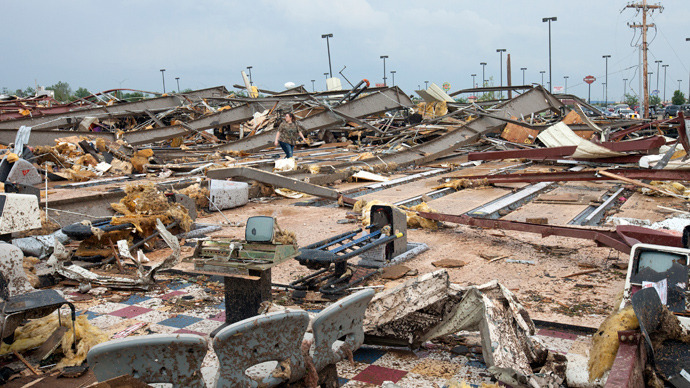 “The whole city looks like a debris field,” Moore Mayor Glenn Lewis said. Rescuers said their efforts had been hampered; even officers familiar with the area were unable to locate landmarks to navigate, especially after sundown. Officials reported that 75 children and teachers took shelter at Plaza Towers Elementary in Moore, which had its roof torn off and was flattened by the passing tornado. The school was the site of a rescue effort for several hours after the storm had passed. "All I could see was destruction. I walked toward a group of people standing by a heaping mound of rubble too big to be a home. A woman told me it was a school," AP photographer Sue Ogrocki said. Fourth, fifth and sixth graders were evacuated to a church, but younger students sheltered in place, KFOR reported. Seven students at Plaza Towers Elementary School were found drowned at the bottom of the wreckage Monday evening. Several other students and school staffers were pulled out alive from the debris during the day, with officials reporting that teachers had shielded students with their own bodies. "In the 30 minutes I was outside the destroyed school, I photographed about a dozen children pulled from under the rubble. I focused my lens each one of them. Some looked dazed. Some cried. Others seemed terrified," Ogrocki said. A first-year teacher at the school told a group of children to shelter in a restroom as the building was rocked by the force of the tornado, KFOR reported. All of them survived the ordeal, and were guided away from the devastated school by rescuers. Rescue teams continued to sift through the destroyed structure on Monday evening, but no additional survivors were expected, according to local media at the scene. Students at another local school, Briarwood Elementary, had been accounted for and moved to a safe location. A man, a woman and a child were found dead under the debris of a collapsed 7-Eleven convenience store and liquor shop where several people were sheltering. On television, both wrecked vehicles and survivors were seen sprayed with mud, while residents emerged after the tornado had passed to assess the damage and locate family and loved ones. There was confirmation of at least one structure on fire, possibly caused by a gas leak after the tornado ripped through the area. KOCO reported that cell phone service was down in the Moore region, and aerial footage showed wide swathes of destruction. Moore was last hit hard by a tornado in 1999, which killed 36 people. 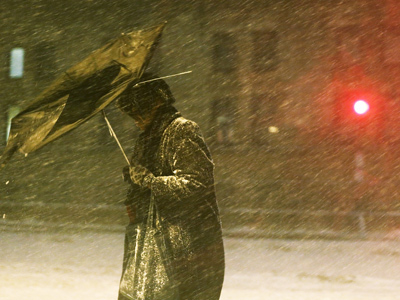 That storm had the highest winds ever recorded near the earth's surface, measured at 302mph. The National Weather Service initially classified Monday's storm as an EF4, the second-strongest type of tornado, with winds of up to 200 mph. That has since been upgraded to EF5. Local reporters who were present for the 1999 storm, however, believe that the damage caused by this tornado is considerably worse. A major utility company, Oklahoma Gas & Electric, has begun to assess damage to its electric grid following Monday's tornado, according to a spokesperson. Below is video purportedly of a Moore family emerging from their storm cellar, witnessing the devastation wrought by the powerful tornado. A severe storm system over the weekend generated baseball-sized hail, high winds and at least 28 tornadoes in the Midwest, including Oklahoma, Kansas and Iowa. Residents remain in hiding as meteorologists forecast that the severe weather conditions will continue to generate destructive twisters. 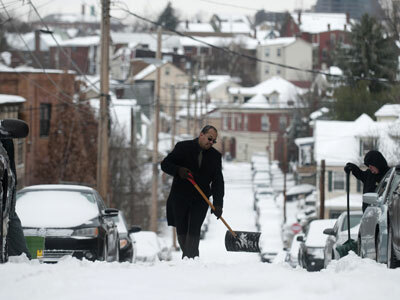 Power companies reported that more than 57,000 outages left people in the dark. In Shawnee, Oklahoma, the body of a 79-year-old man was found lying in an open area of a mobile home community. In some regions, homes were destroyed, cars and trucks were flipped from highways, downed power lines were sprawled across neighborhoods, and trees were uprooted. The Oklahoma Highway Patrol shut down Interstate 40 after semi-tractor trailer trucks and several other vehicles were flipped by wind gusts, Newsok.com reported. 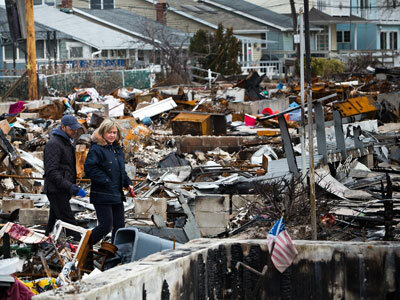 The state was littered with debris from damaged houses, trailers, and vehicles. About 300 homes were in ruins and at least 23 people were injured, according to Fallin and Red Cross spokesperson Ken Garcia. Ethan Mignard, a staffer at a local newspaper, told CNN’s iReport that the damage looked like something he had only ever seen on TV. In some areas, patches of dirt remained where mobile homes once stood, and children’s toys were littered across the ground and hanging from trees. Mignard even came across a plot of land with nothing remaining but the front steps to a house that is now gone. “It looks so out of place… To think that you would have taken these stairs to enter a home, but instead, you look around from up there and you see total destruction everywhere,” he said. Counties across Kansas, Nebraska, Iowa, Oklahoma, Minnesota, Wisconsin, Illinois and Missouri were all placed under tornado watch late Sunday, and are expected to witness more damage.